It can almost be impossible to avoid stressing out. You have a mortgage to pay, you’re concerned your investments with your financial advisor aren’t getting the returns you need for your retirement or you just can’t stick to your budget. But while all of these factors exist in every city to some degree, it is also true that living in a less stressful environment can help you deal with other anxiety-inducing parts of life. So in order to highlight those rare zen-fostering zones, we have ranked the least-stressed cities in America. To rank the least stressful cities in America we looked at data for nine metrics. We examined average hours worked per week, average commute, average amounts of physical activity, entertainment establishment density, unemployment rate, bankruptcy rate, housing as a percent of income, average hours of sleep per night and the divorce rate. Check out our data and methodology below to see where we got our data and how we put it together to create our final rankings. This is SmartAsset’s fourth annual study on the least-stressed cities. Check out the 2017 rankings here. 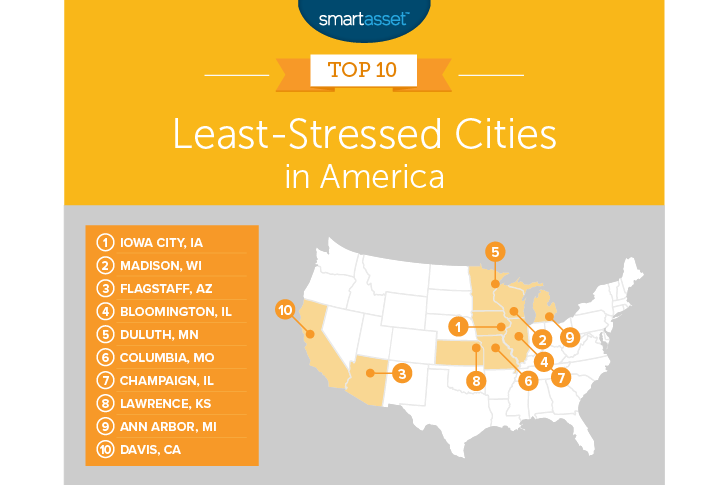 Stress-free Midwest – Cities in the Midwest occupy eight of the top 10 least stressed cities. Midwestern cities typically combine low working hours with affordable housing. So that leaves residents with plenty of free time without the stress of wondering whether or not they will be able to afford their bills. Florida is stressful – Florida cities took all of the bottom seven spots in this study. In particular, Miami seems to be a stressful city to live. Miami, Miami Beach and Miami Gardens were the bottom three ranked cities. College towns – If you’re looking to find a youthful, stress-free city, college towns are a good place to start your search. In total, seven cities in our top 10 are college towns where major universities are an important part of the local economy. Iowa City takes the top spot. Perhaps most important to dealing with stress is having some free time to stay on top of things. Residents in Iowa City have plenty of me-time, according to our data. This city ranks sixth for average hours worked per week at only 34.1. In fact, residents here don’t waste time getting to and from work either. The average commute is just over 16 minutes, meaning the average worker spends only around 32 minutes getting to and from work, another low score. Two other types of devastatingly stressful occurrences are rare here as well. The city has the 23rd lowest divorce rate and the 13th-lowest bankruptcy rate. Physical exercise has been shown to be a good way to lower stress. Residents in Madison, Wisconsin do a great job of staying fit and staving off stress. This city ranks better than 85% of cities when it comes to physical activity. Residents here can also rest easy without too much worry of losing their jobs. This city has an unemployment rate of only 3.8%. In total, Madison ranks in the top third for every single metric we analyzed. Looking for a short commute with manageable work hours? It will be tough to beat Flagstaff, Arizona. This city ranks in the top 10 for both of those metrics with a low 34.2 average hours worked per week and an average commute of only 14.4 minutes. And if you struggle to get a good amount of sleep, another stressor in many Americans lives, moving to Flagstaff may be the antidote. The average resident here gets more than 7.1 hours of sleep per night. But if you are concerned about how promising you are as a job candidate, Flagstaff may not be the place for you. This city has a pretty high unemployment rate. So any job opening will have plenty of competitors fighting to get hired. Plenty of Americans find themselves unable to afford their homes. You can imagine how stressful it is to wonder if you will be able to cover rent or your mortgage payment month-to-month. Fortunately that situation is less common in Bloomington that it is elsewhere, thanks to affordable housing costs. The median home here costs only 17.5% of the median household’s income, a top 10 rate. Jobs here are also pretty easy to come by, this city has an unemployment rate under 3%. And since everyone is working you may be asking yourself if there is a lot of traffic in Bloomington. Well, Census Bureau suggests that getting to work in Bloomington will be a pleasant part of your morning and afternoon. The average commute time here is under 17 minutes. Lots of sleep, reasonable work hours and short commute times, that’s what Duluth offers its residents. Residents in this sleepy town get an average of 7.2 hours of sleep per night, fifth most in our study. And it makes sense that Duluth residents have plenty of time to get some shut-eye, the average worker only works 35 hours a week. Combine that with an average commute time of 15.7 minutes and you can see how Duluth won’t put any extra stress on your life. If you were to make an argument against Duluth you may point to the relatively low number of restaurants, bars and entertainment establishments. This city has the second-lowest score in the top 10 for that metric. Columbia, Missouri, right in the center of the country, ranks sixth. This is a college town home to the University of Missouri. Many residents here live close to their place of employment and the average commute is under 16 minutes. Work hours here are also manageable. The average worker here spends 36 hours at work a week but is usually still able to afford housing. The average household here would only need to dedicate 20% of its income to covering the costs on the median home. Unfortunately, Columbia has a high bankruptcy rate and a low entertainment establishment rate. So it’s not as convenient to distract yourself after you file for Chapter 13. 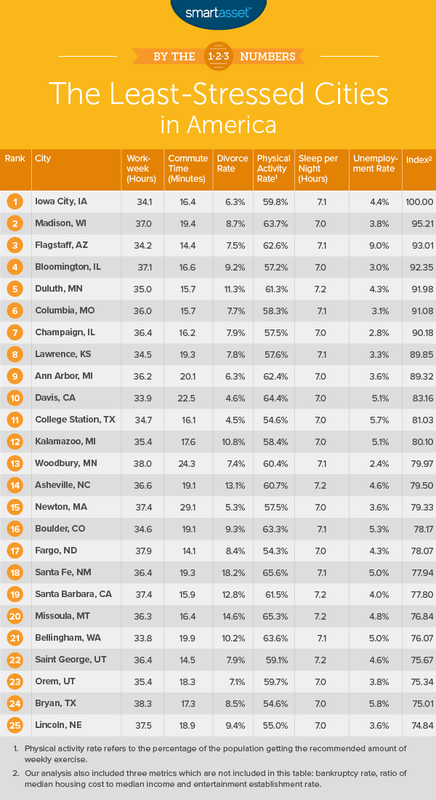 Yet another Midwest college town appears in this top 10. This time is Champaign home to the Fighting Illini of the University of Illinois. The unemployment rate here is low, letting residents stay relaxed about the possibility their job disappearing. This is also a fun place to live, and it can be tough to handle stress if you can’t blow off steam every once and a while. In total about 13% of all establishments in Champaign are dedicated to bars, restaurants or entertainment establishments, a top 30 rate. Lawrence, Kansas, the home of University of Kansas, comes in eighth. Work hours here are very manageable. The average worker only works 34.5 hours per week. That is a top 10 rate and makes this a great place to live for people who enjoy having hobbies. This city also ranks in the top 15% of cities for entertainment establishment rate, unemployment rate, hours of sleep per night and divorce rate. It is only the high bankruptcy rate of 0.24% which stops Lawrence from climbing higher in the ranks. Another Midwest college town occupies a top 10 spot. Ann Arbor is notable for its balanced approach to a stress-free existence. This city ranks in the top half for every metric but one: median housing costs as a percent of median household income. The divorce rate here is very low, saving residents here some heart break and lawyer bills. And despite the relatively high cost of living, jobs here aren’t too hard to find so most people should be able to pay the bills. This city has an unemployment rate of 3.56%. Davis, California is the only city in a coastal state, to rank in this top 10. Although given that Davis is in central California it is not the most coastal of cities. It is, however, a college town home to the University of California Davis. Residents here don’t overexert themselves at work keeping stress levels low. Divorce here is almost unheard of, only 4.6% of residents who live in Davis have been divorced. For each of those metrics Davis ranks in the top 5. Of course the city is in California and comes with those high California costs of living. This city has the worst housing cost as a percent of median income in our top 10 at 27.4%. Average hours worked per week. This is the length in hours of the average work week. Data comes from the U.S. Census Bureau’s 2016 1-Year American Community Survey. Average commute time. This is the average amount of time it takes to get to work. Data comes from the U.S. Census Bureau’s 2016 1-Year American Community Survey. Percent of residents getting sufficient physical activity. Data comes from healthdata.org. Entertainment establishment rate. This is the number of bars, restaurants and entertainment establishments as a percent of all establishments. Data comes from the Census Bureau 2016 Business Patterns Survey. Bankruptcy rate. This is the percent of residents who filed for bankruptcy in from June 2017 to June 2018. Data comes from uscourts.gov and is measured at the county level. Housing costs as a percent of income. This is median housing costs as a percent of median household income. Data on both metrics comes from the U.S. Census Bureau’s 2016 1-Year American Community Survey. Average hours of sleep per night. Data on sleep patterns comes from Jawbone. Divorce rate. This is the percent of residents living in a city who are divorced. Data comes from the U.S. Census Bureau’s 2016 1-Year American Community Survey. First, we ranked each city. After that, we found each city’s average ranking, giving equal weight to each metric. Then we used this average ranking to create our final score. This city with the best average ranking received a 100. The city with the lowest average ranking received a 0. Commit to a budget – By committing to a strict budget you can avoid future stressful situations. A budget will help you save money. That gives you a buffer in case any financial emergencies arise. It also leaves you without any surprises when it comes time to pay your bills. Don’t make every decision yourself – Managing your finances is complicated and stressful. If you are not a finance expert yourself, not only are you spending a ton of time trying to make financial decisions, you also take the risk you are making the wrong financial decisions costing you money. A financial advisor can help you do the math to make sure every financial decision you make is the right one. So if you don’t know where to find a financial advisor, check out SmartAsset’s financial advisor matching tool. It will match you with up to three local financial advisors who fit your needs.